My trusty Galaxy Nexus has just received its fresh Android 4.3 OTA, which, on the plus side, brought "improvements to performance and stability", but has also wiped out root along the way. 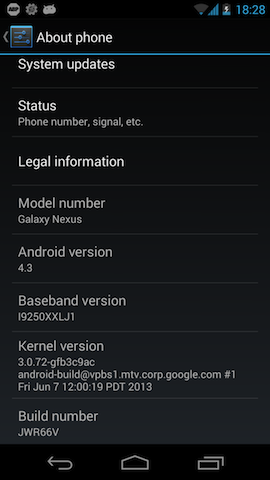 When life gives you lemons... you write a blog post about delicious lemonade you've made, so I decided to update my old guide on how to root JB Galaxy Nexus. Check the link if you need more detailed explanation of each step. First thing first, if you haven't done so yet, reveal Developer options in settings, enable USB debugging, unlock your bootloader and install or update adb, fastboot and other tools. I've written posts about that in the past, so follow the links if you need a walkthrough. Download the latest ClockworkMod Recovery image for Galaxy Nexus (GSM) from ClockworkMod site, at the moment it's recovery-clockwork-touch-6.0.3.4-maguro.img and save it as cwm.img in your home directory. Download the latest SuperSU CWM installable ZIP using the link in the XDA-Developers forum thread (UPDATE-SuperSU-v1.45.zip at the time of this writing) and save it in the same directory as CWM Recovery image. Device will boot in to CWM recovery and present you with various options. Choose install zip option, then chose zip from sdcard, then 0/ - this is the default path to internal sdcard, then find and select the UPDATE-SuperSU-v1.45.zip file we pushed earlier. Chose Yes - Install UPDATE-SuperSU-v1.45.zip when presented with confirmation dialog and SuperSU will be installed from sdcard. Once installation is complete select +++++Go Back+++++, then reboot system now. I personally choose not to disable recovery flash when presented with the next prompt. You might want to update the SuperSU app via GooglePlay if you're not using the latest version, and it's done.